An AUDIOBOOK is a recording of a text being read. A reading of the complete text is noted as "unabridged", while readings of a reduced version, or abridgement of the text are labeled as "abridged". Spoken audio has been available in schools and public libraries and to a lesser extent in music shops since the 1930s. Many spoken word albums were made prior to the age of videocassettes, DVDs, compact discs, and downloadable audio, however often of poetry and plays rather than books. It was not until the 1980s that the medium began to attract book retailers, and then book retailers started displaying audiobooks on bookshelves rather than in separate displays. 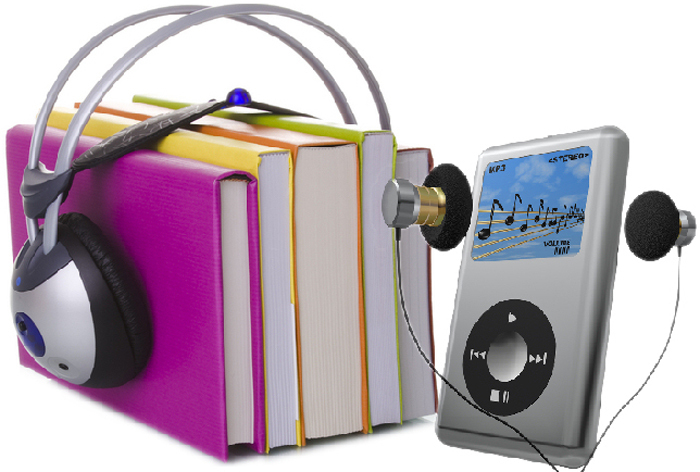 224 Places For Free Audio Books Online - Gizmo's Freeware. 550 FREE AUDIO BOOKS - Open Culture. AMAZON.COM: DOWNLOADABLE AUDIOBOOKS - as of October 23, 2014: 121,203 titles. AUDIBLE.COM - "Listen to a Best Seller on your iPod or MP3 player!" Provider of spoken audio entertainment, information, and educational programming. Audible sells audiobooks, radio and TV programs, and audio versions of magazines and newspapers. Audiobooks on the App Store on iTunes - Apple. AUDIOBOOKS.NET - "Stream and Download Audiobooks to your iPhone, iPad, Android, or PC. Get a Free Audiobook!"" AUDIOBOOKS.ORG - "Free Audio Books." AUDIOBOOKSFORFREE.COM - "MP3, iPOD and DVD audiobooks (adventures, detectives, horrors, classics, children, non-fictions, philosophy, etc.) for you to download and enjoy." FREE CLASSIC AUDIOBOOKS - "Digital Narration for the 21st Century." Hoopla Digital - "Enjoy thousands of movies, TV shows, videos, music and audiobooks that library card holders can borrow from their public library." LIBRIVOX - "Free public domain audiobooks." LibriVox audiobooks are free for anyone to listen to, on their computers, iPods or other mobile device, or to burn onto a CD. Loyal Books - "7,000+ Free Audio Books & eBooks Downloads." OPEN CULTURE - "The best free cultural & educational media on the web." Download 550 great books for free. OverDrive - "eBooks, audiobooks and videos for libraries." OverDrive libraries add to their collections from a catalog of over 2 million eBooks, audiobooks, and videos. Start exploring to see what's out there. Project Gutenberg - "Browse By Category: Audio Book, human-read." Scribd - "Scribd Selects Audio. Hand-picked favorites from our editors. Browse scribd selects audio· Top Audiobooks. What's trending, bestsellers, award-winners & more." THE GREAT COURSES - Audio & Video Lectures from The World's Best Professors - Amazon.com. As of October 23, 2014 the company offers more than 1,545 courses, which span more than 10,000 hours of content across several subject categories: business and economics, fine arts, music, ancient and medieval history, modern history, literature and English language, philosophy and intellectual history, religion, science, mathematics, social sciences, and better living.